Aylesbury United were unable to translate their cup form into the league on Saturday when their gradual slide down the Division One Central table continued with a 2-0 home defeat to Kempston Rovers. After their fine cup win over Bishops Cleeve in midweek, the Ducks have now dropped to 14th after losing four of their past six league games. 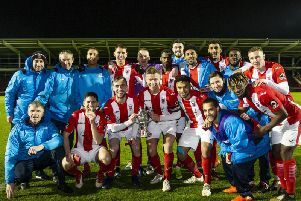 Manager Glyn Creaser stuck to the adage of never change a winning team for the visit of play-off chasing Kempston but the blustery, wet conditions played a big role in preventing United from settling into their usual rhythm. Indeed, it was the visitors who had the early chances. On three minutes, Jamaine Ivy crossed towards his skipper Ash Fuller, whose shot from 20 yards was miscued and went wide of the target. However, Fuller was to make amends for that miss in the 16th minute, when he was left unmarked to side foot past Zaki Oualah after a low ball across the face of the goal had evaded the Ducks defenders. The Ducks eventually got to grips with their opponents and the conditions in a more even passage of play before half-time with Sonny French shooting straight at Carl Knox and Reece Cameron off target. In the 24th minute, Aylesbury almost equalised in the most unlikely of fashions. A foul on Brito on the halfway line saw Oualah take a wind-assisted free-kick which almost caught Knox out, the visiting keeper having to be alert to palm around the post. A more orthodox free-kick shortly afterwards from Cameron was the closest the Ducks came in the first-half, his stinging shot from 20 yards again beaten away by Knox. As half-time approached, the Ducks had one more opportunity to level; a trademark mazy run from French saw the ball fall on the volley to Brito, but again he could only direct his shot wide of the post. The home side continued to create chances in the second-half with Brito curling a shot off target and then French lashing wildly wide in a glorious chance to equalise. In the 72nd minute, the visitors scored the all-important second goal. A poor header from Gavin Hinds-Cadette and a scuffed clearance by Ryan Kinnane saw the ball drop to substitute Luke Heneghan 25 yards out and his deflected shot left Oualah helpless. That virtually killed the game and sealed Kempston’s victory, leaving Aylesbury to focus on the League Cup semi-final against St Ives tonight, Tuesday.